A few months back I had the opportunity to sample the Spring menu at Seasons 52 and loved it. (you can read my review here) For those of you that aren't familiar Seasons 52 is a casual yet sophisticated fresh grill restaurant and wine bar with menus that are inspired by the seasons and what's available at the farmers' market. With summer well under way the restaurant has unveiled a new personalized wine tasting experience that will run through the end of August. (and with any luck for us diners even longer) For only $15 per person guests can enjoy a customized wine flight consisting of three pours from 8 varietals hand selected by Master Sommelier George Miliotes. After sampling diners will receive a full pour of their favorite to enjoy with a flatbread of their choosing. Oh and if you've never had the flatbread from Seasons 52 you will definitely want to try them. These thin crisp pizzas are served on a wood board and topped with the most delectable combination of ingredients. On this visit I sampled the Garlic Chicken and the Gyro (which is the special of the season). Topped with just the right amount of meat, cheese and veggies...I enjoyed both very much. 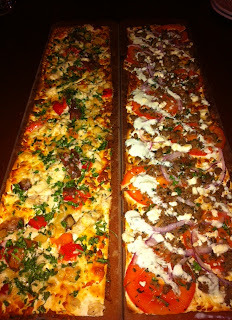 Although not part of the $15 flatbread and flight special it's almost impossible to resist ordering a mini indulgence. A little taste of heaven in a glass cup; for under 325 calories who can resist. I found it intriguing that the one sugar free treat included a mini Oreo cookie. But our waitress, Sally, explained that these are made special for Seasons 52 and do not include sugar. I have to admit that I'm normally not a fan of chain restaurants but Seasons 52 is definitely not your typical chain. Owned by Darden Restaurants the fact that they cook fresh and buy local is what makes them different from other chains. During this past visit I had the pleasure of meeting managing partner, John Barbosa. Hailing from Brooklyn John was a funny guy with lots of great stories about his acclamation to Phoenix. He spent some time with me explaining the concept behind the restaurant and how buying locally means that there are slight variations in the menu across regions. For example there's a Cuban flatbread on the menu in Florida that is not available here in Phoenix. 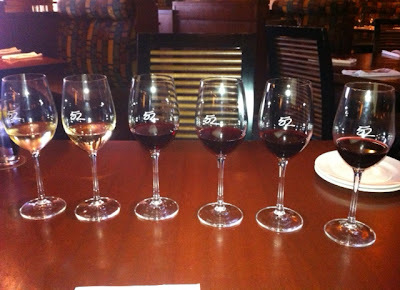 I like the idea of Seasons 52 and what they are doing this month with the flights and flatbread. I hope they continue to bring in more of these specials throughout the coming year. For $15 it makes a great happy hour deal or light summer meal. WOW! That flatbread has me drooling and hungry now!